Finding out that there was a branch of Fuzzy's Grub just a five minute walk from my office was one of the best early Christmas presents I could wish for. 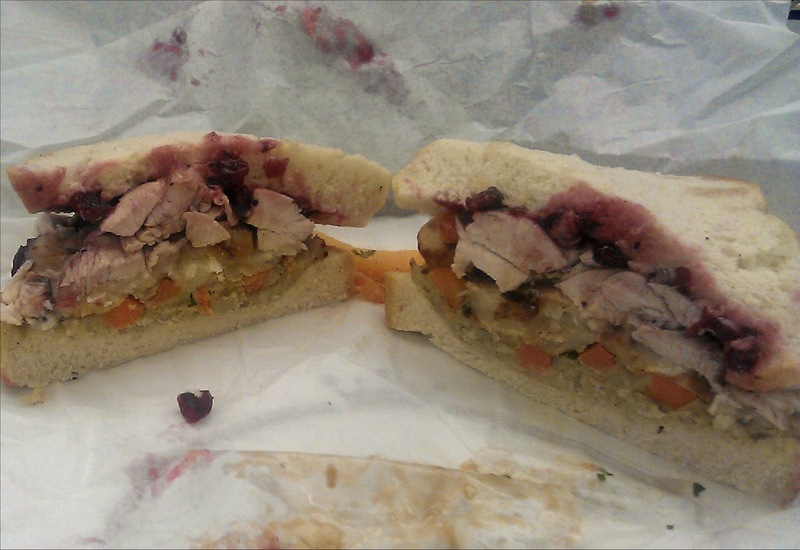 I used to be a regular customer, and I was a big fan of their absurd roast-dinner-in-a-sandwich concept. It was just about the most filling, satisfying, messy, and utterly ludicrous lunch option available. But the chain hit financial trouble, and most of the stores closed a few years ago. So I'm sure that you (my dear readers) can imagine my pure joy at finding a branch alive and well in a tiny alley in the middle of the City. 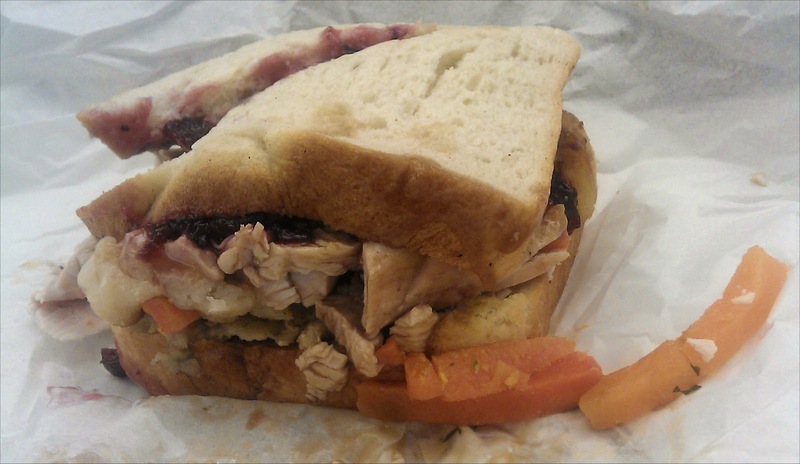 So here we have a Christmas dinner sandwich. Roast turkey, stuffing, carrots, roast potatoes(! ), cranberry sauce, and gravy(!). All squashed between two very thick slices of white bread, resulting in a monstrous sandwich that I could only just fit into my mouth. They have several other roast meats available, along with all the usual condiments, yorkshire pudding, crackling, peas, mash, parsnips, mashed potatoes... even sausages and bacon. My tip - whatever you go for, make sure you order yours with gravy and salt & pepper. Now I know what I'll be eating on boxing day. Oooh that looks good. I used to go past a Fuzzy's branch on my way to work, somewhere near Fleet Street I think. The queue was always out of the door.